"Hopefully not too big. I'm not a big fan of receptions. I'd like to sneak out the back door at the airport tomorrow." ~ Mahesh Bhupathi on the reception he expects back in India after winning the country's first Grand Slam mixed doubles title with Sania Mirza. 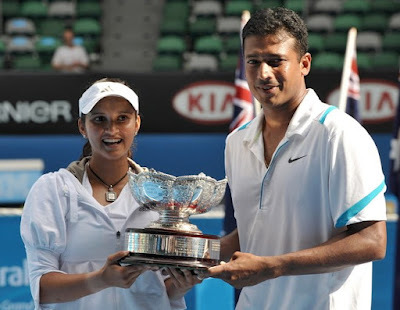 Mirza and Bhupathi beat Nathalie Dechy of France and Andy Ram of Israel 6-3, 6-1 at Rod Laver Arena. "All I know is Serena usually picks up the bill." ~ Mike Bryan makes plan for an all-American celebration in Melbourne. 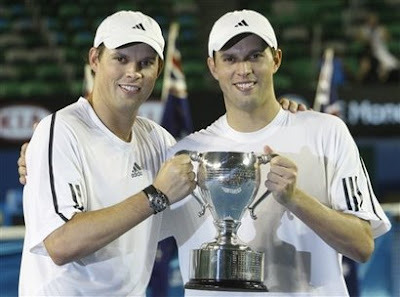 American twins Bob and Mike Bryan won their seventh Grand Slam title with a 2-6, 7-5, 6-0 win over Mahesh Bhupathi and Mark Knowles in the Australian Open doubles final. The brothers, who regained their No. 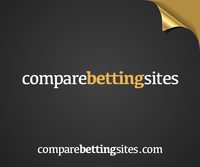 1 ranking by reaching the final, were the second set of American siblings to win Grand Slam titles after Venus and Serena Williams won the women's doubles.